The US Consulate has been sponsoring an English Access Microscholarship Programme since 2013 in the SARVAM villages for 110 students. 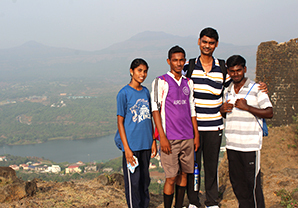 From May 25 to June 12, 2015, the American Councils for International Education arranged an All-India Access Summer Camp in Aamby Valley attended by 6 students and 2 teachers from SARVAM. Sri Aurobindo Rural & Village Action & Movement (SARVAM, an initiative of Sri Aurobindo Society) is actively involved in many developmental programmes for the students and one such programme is the English Access Microscholarship Programme through which the students in the village learn English language through activities and mediums. This programme is sponsored by the US Embassy. 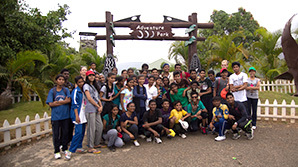 During May and June 2015, the American Councils for International Education had arranged an All-India Access Summer Camp from May 25 to June 12, 2015, at Aamby Valley in Pune. As a part of this programme, 6 students from Poothurai village and 2 Access teachers participated in this camp and learned many different ways to study English, acquire skills and develop their personalities. Most of these students have never even ventures out of their villages, and it was the first time all of them—teachers and students—were travelling by flight. 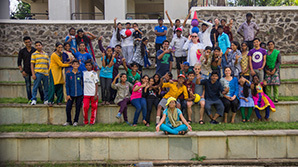 Organized for the first time by the US Embassy in New Delhi, this unique camp had brought together teachers and students from 14 different parts of the country for a weeklong programme of learning and entertainment. 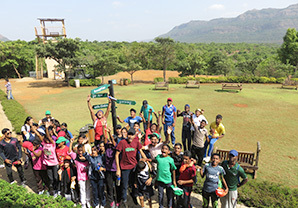 The camp took place in the campus of an international school in Aamby Valley, Maharashtra state, about 120 km east of Mumbai. The Camp was arranged in two batches; the first batch of Camp was held from May 25 to June 2 and the second from June 3 to June 12, 2015. The training sessions were conducted by American teachers for both the students and teachers. Mr. Tom Mooney, the Director of the Camp, provided wonderful times for the participants through his lively and energetic attitude while teaching songs and dance. He had also trained the students in visual arts which was an exceptional experience for the students. The arrangements in the camp, taken care of by Mr Santhosh Kumar, Assistant Camp Director, were highly appreciable. The activities, facilities in dormitory, the delicious and variety of food served in the cafeteria, medical facilities, transportation and all the other provisions were very enjoyable and a delightful experience for all the participants. The American Council also provided Rupees 3,125 as stipend for both students and teachers which was a great surprise and proved very useful for the trip. The venue selected for the camp was also marvelous. Aamby Valley City, the first of its kind is spread over more than ten thousand undulating acres of lush green vastness and it is comfortably nestled amidst picturesque of the great Sahyadri mountain range. All the students were divided in groups and each group was taught by different trainers, handling different kinds of activities in small batches so that all the students got equal attention and a chance to participate. Ms. Jennifer, Mr. David, Ms. Claire and Mr. Jacob trained the students in many life skills and interpersonal skills, but their foremost focus was to guide them in speaking English without any inhibition. Ms. Jeniffer taught clay modeling while Mr. David taught dance, Ms. Claire taught drama and Mr. Jacob trained the students in poetry reading. 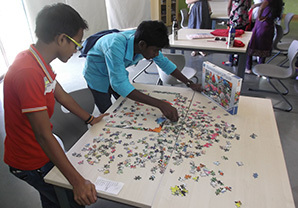 Apart from learning English language skills in regular classes, all the students were given opportunity to select any creative skill of their interest and attend them at different timings. While at the camp, teachers participated in a variety of teacher-training workshops and activities designed to further develop English language teaching skills along with a focus on Critical Thinking, Culture, Stress, Student-Centered Learning, Project Work and Global Issues. There were 14 teachers who were trained separately by Ms. Ann McAllen who is an expert in training teachers. She had conducted training sessions for many teachers all over the world, though this was her first opportunity to work with Indian teachers. It proved to be a great experience for the trainer as well as the teachers. Teachers were encouraged to be vocal about their thoughts and experiences in teaching English in a largely rural milieu in Indian states, and everyday different topics were discussed by the trainer and many beneficial activities were taught to the teachers. Apart from the topics discussed, teachers were also asked to give presentations on best practices being followed in their Access classes with their students. This activity helped all the teachers to learn new teaching methodologies from their peers. At the last day of the camp, all the teachers were divided in groups and were asked to give a group presentation on topics related to global education scenario. This activity helped the teachers to gain more confidence and to learn how to work in groups. 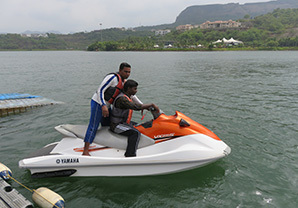 Lots of fun outdoor activities like visits to adventure park, water sports and trekking were arranged on different days, and these were the highlight of the day for the teachers as well as the students. For the students who attended this camp, it has been an eye-opener for them as they have learned and experienced many new things ab out how the world operates out of their little villages. First, they learned the importance of punctuality. The schedule which was followed in the camp all through the whole week was wonderful and all the students had have benefitted from it a lot. Self-confidence of each student increased enormously because of the exposure which was provided to them. Every student was made to talk with the other students from different parts of the country and the inhibition and shyness which they had felt earlier vanished after attending the camp. They also discovered a lot of new things about the cultural similarities and differences from the children of other states. For the teachers too, it was great chance to train in a national and international environment, which has helped them enormously in developing their personality and skills. The exposure and knowledge that had been gained will be very useful to educate the students in Access classes. All in all, the camp was a great success in all its aspects.